There is peace and beauty and a sense of calm with sunset maternity photos in NY. What is it about the beach that makes it so beautiful? Is the mother nature, the cal of the waves crashing into the sand. A sunset like this looks like a rainbow. The summer is the perfect time to do sunset beach maternity photos of amazing expecting moms. I love the beach and wish the summers were longer. What is your favorite time of year? 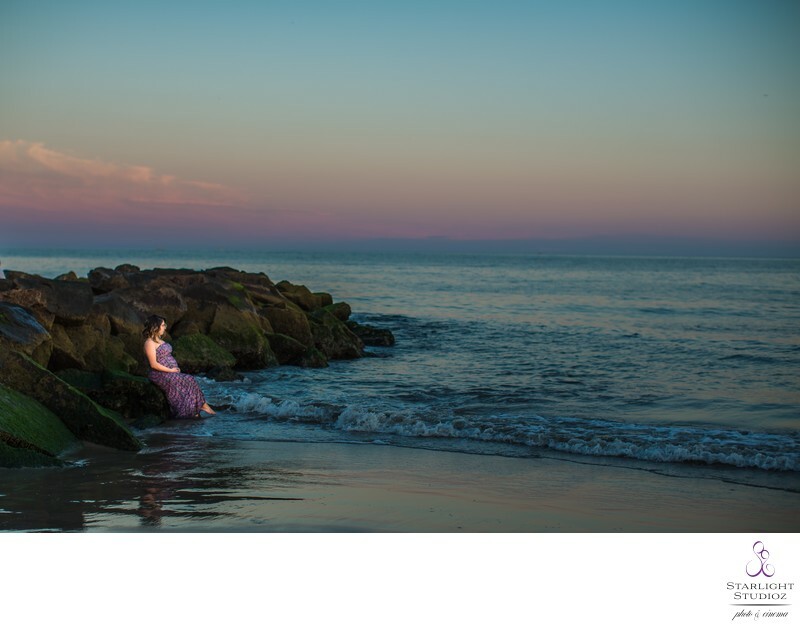 This is one of my favorite photos of Rina on her sunset maternity shoot in Brooklyn, NY in Coney Island by Luna Park. Some additional beautiful sunset maternity photo locations in NYC are, Dumbo, Central Park, Rockaway Beach, Long Beach, Jones Beach, Battery Park, Astoria Park, Brooklyn Bridge Park, Gantry State Park, Shore Road Park, Roosevelt Island, North Cove Park, Grand Ferry Park, Valentino Pier, Red Hook, The Highline, Sputyen Duyveil, Staten Island Ferry, The Press Lounge, Empire State Building, Le Bain, Top of the Standard, Mandarin Oriental.